To access any of our locked downloads please register your details. We then use this information to develop and improve the materials available. Please note that a session cookie will be set for you. EffecTech would also like to send you our quarterly newsletter and occasionally other marketing materials about our products, services and events via email. If you wish to receive these please complete this form. 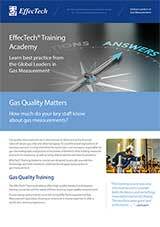 EffecTech Training Academy – Learn best practice from the Global Leaders in Gas Measurement.